A wet Friday evening…My mobile cries out loudly and that was a call from my classmate. The message was that I must report to college on Monday. I got hold of my lecturer’s telephone number and called him up to tell him my position. My ticket was booked for a train leaving from Bangalore only on Monday at 8pm. This would reach me to Mumbai only at 8pm on Tuesday. My lecturer told me to find some other way to reach back since the matter was urgent and my absence could bring in trouble! The next day, I started searching frantically for tickets at the Bangalore City Station’s reservation counter and could not get any ticket. We (Myself and my parents) proceeded to the Kempegowda Bus Station a.k.a. 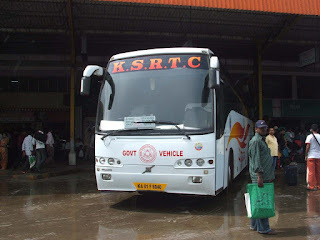 Majestic to enquire about tickets in KSRTC’s Volvo service to Mumbai. A “slow” link welcomed us, and reservations were not possible! We left In search of another reservation counter, and zeroed in on the KSRTC reservation counter at Jaya nagar. The queue at the counter was small and managed to reach the clerk soon. He typed in the details and said that just once seat was available on the bus that leaves Kempegowda Bus station at 3pm on Sunday. I confirmed the booking, and a computer printed reservation ticket is issued for the same. The fare was Rs. 1111 including taxes. After getting the ticket, we proceeded to the Railway counter to cancel my seat in the train. Another wet day…Sunday, May 28 2006, 1330 hours: Myself, my dad, brother and sister-in-law, left the home on a car. We slowly moved towards Kempegowda Bus Station (a.k.a. Majestic). We reached majestic some 40 minutes later. As we got down from the car, it started pouring down. Luckily the down-pour was short. We made it into the bus station. Kempegowda Bus Station, popularly known as Majestic, is the Central bus station for intra-state as well as inter-state services operated by different state transport corporations. 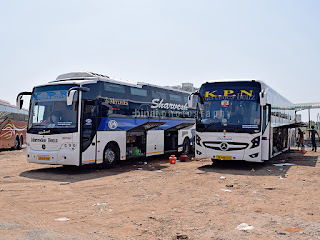 The bus station is very huge and has direct bus services to almost all major cities and towns in Karnataka and the neighboring states. My bus was to depart from Platform one at 1500 hours. The other platforms mostly had buses to places inside the state. There is a dedicated platform for buses towards Mysore, and there are buses every 10-15 minutes. My bus came in at about 1430. The bus, a Volvo owned-by the Karnataka State Road Transport Corporation (KSRTC), was sparkling clean. 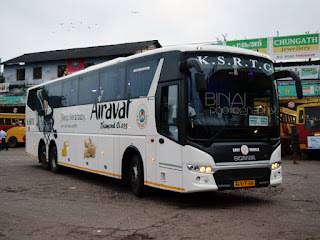 The service is named as “Airavat”, and the buses are usually white in colour to signify the name! The registration number of the bus was KA-01-F-8040. The bus has two drivers and one conductor. The passenger bagged is stored in the luggage carrier under the body of the bus. Only hand baggage is permitted inside the bus. My seat number was 39 which is in the rear of the 45-seater bus. This route is supposed to have a semi-sleeper bus, but today it was a normal bus. Sharp at 1500 the bus left from the terminus. The first four seats of the bus were kept aside for the crew, and the last five seats were un-reserved. There were 5 passengers going to Belgaum, who occupied the unreserved seats. The ride was smooth and calm unlike normal AC buses. The engine is rear-mount and is too powerful for Indian roads. The 7-litre engine which churns out 260hp of power is adequate enough to power the Air-Conditioning also! Each passenger has an individual air outlet and a reading lamp. The Air-suspension dampens most of the jerks, but the major ones are known. I could hear the whine of the engine since I was sitting right above it! The bus crawled through the crowded Bangalore roads and finally managed to reach the outer limits. FM radio was played in the bus till the outskirts of the city. As the bus reached Neelamangala, the FM was unclear and hence the Conductor switched it off, and decided to play a movie. The movie turned out to be the Ajay Devgan starring Shikhar. It was raining outside, and the bus was flying on the road. The highly powered engine made overtaking easy for the driver. 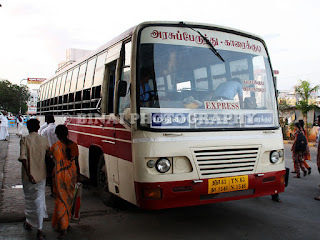 The bus has retarders and hence braking from a high speed is also easy for the driver. He was maintaining speeds in the range of 80-100 at most of the stretches. We pulled into a Kamat group hotel at Sira for evening snacks at about 1700. We left the place at 1730. The bus doesn’t stop at any bus station unless and until there is someone to get down. We entered Davangere bus station by “mistake”. The bus left the bus station without even stopping. The driver stopped at a Hotel for Dinner at 2000. The hotel was big and clean. We had a halt of almost an hour there, and finally departed at about 2100. The second movie, Bobby Deol starring Jurm, was being played. The movie got over by about 2200, and the conductor put down the curtains. The bus cruised past villages and towns before finally stopping at Belgaum at about 2330. The bus left the bus station after a short break, and finally pulled into some “unidentified” bus depot – a depot is a shed where buses are parked in the night – and filled the fuel tank. The bus continued its run, and I felt asleep sometime later. I woke up at about 0600 am, and the bus was then on the outskirts of Pune. There is a small gradient just before Pune, and normally buses find this climb very difficult. But in this case, the bus was rather overtaking other heavy vehicles on its climb!!! We pulled into Pune city and the bus entered Pune Swargate Bus Station at about 0700. About 6-7 passengers got down here. Two seats were vacant since Kolhapur, and the bus took in 9 more passengers from Pune. Now all the 45-seats were occupied. The bus left Pune bus station at about 0730. The driver rushed across some small roads, and directly entered in the Bye-Pass road instead of crawling along the city roads. The bus quickly picked up speed, and we soon entered the expressway. The driver was maintaining a speed of atleast 100 kmph on the expressway. To our company was a Volvo operated by MSRTC which was literally at or above our speed. We pulled into a food plaza at about 0800. I was not is a mood to have breakfast, and instead opted to have a Tea. We left the food plaza at about 0820, and the driver resorted to “flying”. The bus exited the express way at about 0845, and finally reached Belapur at 0900. I had earlier informed the conductor that I wanted to get down at Belapur and he accordingly had the bus stopped at Belapur. The speed was surprising! The bus managed to cover the 100-odd kilometer distance in just over an-hour! Anyway, I had luggage in the under-floor luggage compartment. The conductor opened it for me, and the bus left soon after! I had a walk to the nearest Auto-Rickshaw stand, and took one home! Overall, I would rate the journey at 8/10. The ride was comfortable, the AC was powerful. The only problem was that the sleep wasn't comfortable (due to personal constraints!). The timings was nice. These buses really pose a risk for railways! A train takes anywhere between 23-25 hours while this bus takes only 18-19 hours!